Definition at line 39 of file itkSymmetricEllipsoidInteriorExteriorSpatialFunction.h. 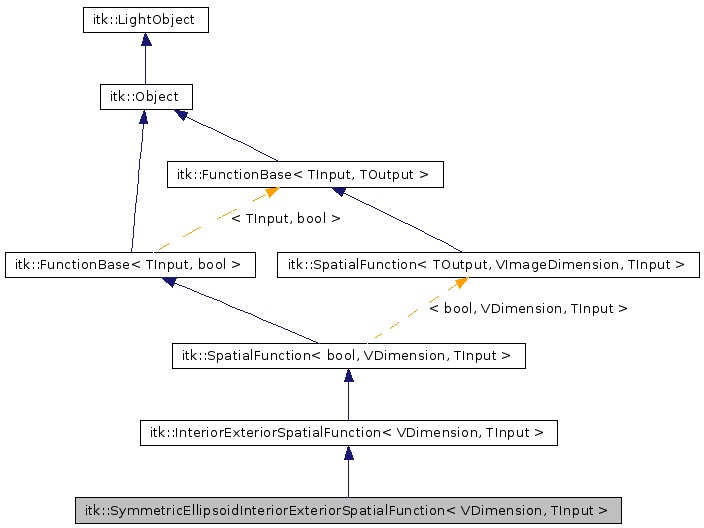 Reimplemented from itk::InteriorExteriorSpatialFunction< VDimension, TInput >. Definition at line 47 of file itkSymmetricEllipsoidInteriorExteriorSpatialFunction.h. Input type for the function. Definition at line 54 of file itkSymmetricEllipsoidInteriorExteriorSpatialFunction.h. Output type for the function. Definition at line 60 of file itkSymmetricEllipsoidInteriorExteriorSpatialFunction.h. Definition at line 46 of file itkSymmetricEllipsoidInteriorExteriorSpatialFunction.h. Definition at line 44 of file itkSymmetricEllipsoidInteriorExteriorSpatialFunction.h. Definition at line 45 of file itkSymmetricEllipsoidInteriorExteriorSpatialFunction.h. Definition at line 48 of file itkSymmetricEllipsoidInteriorExteriorSpatialFunction.h. Evaluates the function at a given position. Implements itk::InteriorExteriorSpatialFunction< VDimension, TInput >. Get and set the center of the ellipsoid. Set the orientation vector of the ellipsoid's unique axis and axes lengths. Must be normalized!!!! !